Day to day staff meetings in your company may often be informal, however, once every so often, you may host that hugely important meeting that could really make or break your company. It’s crucial to make the right impression for your potential clients, prospective investors and business associates. Follow these simple rules and you will have a boardroom that shows you mean business. Firstly, you’ll need to ensure that the location is large enough to accommodate the amount of people intended for the meetings. You will also need to ensure the location is quiet and away from the hustle and bustle of the office environment. After you’ve decided on your location, you will need to decide what technology is required within the boardroom in order to facilitate the meetings for example: a TV, power modules, speakers and conference call set ups. Moving on to the boardroom table, which is arguably the most important part of the room. This is where the big decisions are made so choose wisely. 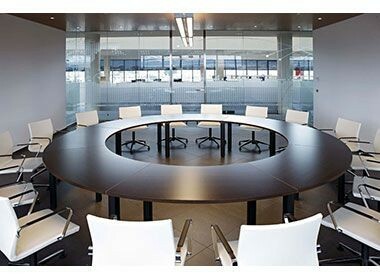 Boardroom tables are available in all designs and sizes with an array of finishes available. Whatever the image you’re trying to portray, we will be able to find something which will reflect that. If you opt for a smaller boardroom table it will create a more intimate setting that’s prone to plenty of discussion. A larger grander boardroom table will accommodate a larger amount of people for the bigger business meetings. As meetings tend to run for a while, it’s important that your clients are sitting comfortably throughout. A chair that is uncomfortable to sit on may provoke your clients to lose concentration because they are more worried about their aching limbs. It’s very important to get the seating right, and to do this you will need an office chair that not only compliments the boardroom table but also provides a comfortable base for those lengthy meetings. A comfortable client will be happy and fully relaxed. OfficeReality can help you to achieve this environment. Our highly trained sales team will answer any questions you have regarding your new boardroom. The sales team will have an extensive look into the criteria you’ve provided as well as working with you to develop the vision you’re looking to obtain.